The core of Vanhoozer’s proposal consists in a series of striking theatrical metaphors for theology, Scripture, interpretation, the Church, and even the pastor (p.xii). For him, these metaphors are appropriate because the world of “faith seeking understanding” is itself dramatic. He explains, “At the heart of Christianity lies a series of divine words and divine acts that culminate in Jesus Christ… The gospel—God’s self-giving in his Son through the Spirit—is intrinsically dramatic” (p.17). As a theological metaphor, the theater can also help show “how we come to know things not simply by beholding and contemplating them but by indwelling and participating in them” (p.79). The Drama of Doctrine is divided into four main parts (pp.31-33). In the first section, Vanhoozer sketches out his thesis: that doctrine and even the gospel itself can best be understood in theo-dramatic terms (nodding to the work of von Balthasar). He also explains his directive theory of doctrine, which is near to the heart of the book. In the second part, Vanhoozer seeks to find a more fruitful way of relating Scripture and tradition, leading to an attempt to rehabilitate the idea of Sola Scriptura for the postmodern world by understanding it to be more of a practice than a principle. The third part of the book is where Vanhoozer fully lays out his conception of canonical-linguistic theology. In doing so, he also differentiates it from other similar approaches, like George Lindbeck’s cultural-linguistic approach. The final section of The Drama of Doctrine contains an extended discussion of the implications of Vanhoozer’s directive account of doctrine, looking at its importance in the life of both individuals and church communities (pp.31-33). With that overarching summary out of the way, I think it goes without saying that there’s a lot we could choose to stop and dig into. For our purposes, it will be enough to slow down and discuss a few of the points raised by Vanhoozer throughout the pages of The Drama of Doctrine. First, there is his comparison of different approaches to the nature of doctrine. Vanhoozer contrasts “epic” and “lyric” styles of doctrine alongside more “dramatic” approaches (p.84). The epic perspective reaches back to the philosophy of Hegel and tries to give an absolute, comprehensive explanation of doctrine. He explains, “Systematic theologies resemble epics to the extent that they appear to be written by impersonal and omniscient narrators who stand nowhere in particular” (p.85). Vanhoozer thinks that much of modernist theology fall within this epic framework. Another term for the epic style is “cognitive-propositionalist” theology (per Lindbeck) (p.84). Despite being vastly different from each other, he judges both Chales Hodge and Rudolf Bultmann to have worked from within this epic/cognitive-propositionalist framework. For Vanhoozer, “The main problem with epic theology… is that it opts out of the drama altogether and takes ‘an external, spectator’s perspective on the completed play'” (p.86). 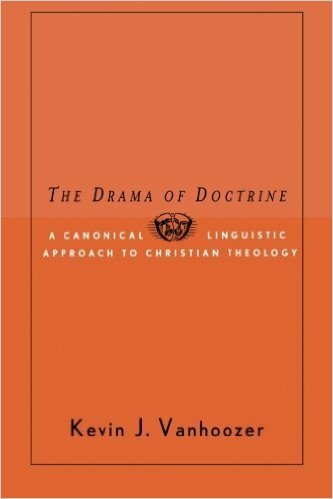 In contrast to the epic and lyric approaches to theology, Vanhoozer believes the cultural-linguistic conception of doctrine, as advocated by the postliberal theologian George Lindbeck in The Nature of Doctrine, to be much closer to his dramatic proposal, though not without some differences (p.93). This leads us into the second main discussion in The Drama of Doctrine that we will look at: the differences between Vanhoozer’s canonical-linguistic theology and Lindbeck’s cultural-linguistic approach. The Achilles heel of the cultural-linguistic approach, for Vanhoozer, is that practices can become empty and hollow; traditions can become corrupt and self-serving (p.22). Again, to say this is far from advocating a marginalization of tradition/practice in the life of the Church. Rather, it is to affirm the importance of Scripture’s ability to speak over against traditions and church practices when they are found to be wanting (p.17). This leads to Vanhoozer’s most biting criticism: he claims that Lindbeck’s attachment to the normative importance of church practice leads potentially to a situation where “doctrine does not direct the community but is directed by it” (p.97). Vanhoozer’s solution for this problem is to re-emphasize what Nicholas Wolterstoff calls divine authorial discourse (p.11). He thinks that the way forward is to “see the Scriptures themselves as ‘spirited practices'” (p.99). In other words, it’s not that narrative, rhetoric, and communal use aren’t important, but that “on the dramatic view, God gets the principle speaking part” (p.99). As we mentioned earlier, the canonical-linguistic approach subscribes to a directive approach to doctrine. So briefly, let’s look at what this means. I think this portrait sketched by Vanhoozer is a great way of bridging the ugly ditch that has all-too-frequently divided theological belief and practice in recent times. We have seen that for Vanhoozer the gospel can be compared to a drama, Scripture can be compared to an authoritative script, and doctrine can be understood as directions for participating fittingly in the drama. This all leads to a question, though: “Who in the church corresponds to the director?” (p.243). Vanhoozer’s answer to this forms the third point we will explore here. The job of the director includes serving as the “mediator between the script and the actors,” which leads some to identify the director with the theologian. Vanhoozer, on the other hand, thinks it best to see the Holy Spirit as “the principal director of the church” (pp.243-244). What does this make the theologian? A dramaturge, “the adviser to the director and company alike” (p.244). The dramaturge has up until recently been a relatively unknown figure in the world of American theater, according to Vanhoozer. However, “In Europe… the dramaturge is the person responsible for helping the director to make sense of the script both for the players and for the audience” (p.244). In this framework, the dramaturge is tasked with researching and preparing the script for use. Other tasks include: selecting a edition/translation of the play, investigating the historical situation of the script, and looking at how the play has been performed in the past (p.244). The parallels of these activities with the work of a theologian are significant. In addition to these script-oriented tasks, the dramaturge also concerned with ensuring that the actors perform well. Some additional tasks include leading interpretative discussions, writing study guides, giving lectures, and writing scholarly essays and books for the community. As Vanhoozer puts it, “One is hard pressed to think of a better job description for the theologian than that” (p.245). He goes on to take readers on an exploration of Constantin Stanislavsky’s way of teaching acting, a technique frequently referred to as “the Method” (p.369). The heart of the Method is the desire to embody dramatic roles in compelling ways, to avoid what Stanislavsky called “mechanical acting.” To act mechanically means to “suffer from a lack of coincidence between the inner and outer man,” which is fairly similar to the Scriptural category of hypocrisy (p.370). Thus, even in dealing with the criticism of hypocrisy, theatrical metaphors for theological issues can be potentially fruitful. The Drama of Doctrine is an ambitiously grand, and ambitiously dense, piece of academic theology. His proposals are both creative and constructive, and this has been one of the more rewarding reads that I’ve had in quite a while. I still have some questions regarding how he thinks about situations where issues of doctrinal directives seem to conflict (ex. between denominations), but Vanhoozer has nevertheless given plenty of food for thought for those seeking to find more fruitful ways of understanding the relationship between theological practices and beliefs. I happily recommend it. This entry was posted in Book Reviews and tagged Biblical Hermeneutics, Doctrine, Drama, George Lindbeck, Hans Urs von Balthasar, Hermeneutics, Kevin Vanhoozer by joecrow91. Bookmark the permalink.